Giants are regular characters in fairy tales and folklore. However, there were real-life giants that once lived here on Earth. They were exceptionally tall with heavy weights and voracious appetites to match. In most instances, they end up with life-threatening ailments as their bodies could no longer support their height and weight. Too often, they were regarded as circus exhibits and a jumble of statistics rather than humans who had the same wishes and dreams for their lives as the rest of us. Fyodor Makhnov (alternatively spelled “Fyodor Machnow” or “Fedor Machnov”) was born in Kasciuki (in today’s Belarus) in June 1878. He started growing rapidly at eight and measured 200 centimeters (6’7″) when he was 14. He wore custom-made clothes and shoes and slept on a custom-made bed. His boots reached the waist of normal-sized people, and children often hid inside his boots when playing hide-and-seek. Makhnov joined the circus when he was 14 but started performing at 16. Although sources vary about his height, he would later reach approximately 250 centimeters (8’2″) as he grew into adulthood. Scientists often met him to ask for contracts for ownership of his corpse, but he always refused over fears that he could be murdered. He later married Efrosinja Lebedeva, who was 100 centimeters (3’3″) shorter than him even though she was taller than most women. They had a girl and three boys. Makhnov had a huge appetite. Every day, he consumed a hefty breakfast of 20 eggs, eight loaves of bread, and 2 liters (0.5 gal) of tea. For lunch, he consumed 1 kilogram (2.2 lb) of potatoes, 2.5 kilograms (5.5 lb) of meat, and 3 liters (0.8 gal) of beer. For dinner, he managed a loaf of bread, 15 eggs, and 1 liter (0.3 gal) of milk. He died in 1912 at age 34. Adam Rainer is the only known dwarf who ended up becoming a giant. He was born in Graz, Austria, in 1899. He tried joining the army when World War I broke out, but he was rejected because he was too short. He measured a measly 138 centimeters (4’6″). A dwarf is anyone below 147 centimeters (4’10”). He tried again the following year but was rejected another time. At 19, he measured 143 centimeters (4’8″). Rainer started growing at age 21, eventually reaching an astonishing 216 centimeters (7’1″). His spinal cord curved as he grew taller while his face and jaws got bigger. He underwent surgery to stop his pituitary gland from creating more growth hormones. The surgery did not stop him from growing but merely reduced the rate at which he grew. His health was affected by his condition, and he soon went blind in one eye and deaf in one ear. Ultimately, his curved spine caused him to become bedridden. He died at age 51 after reaching a height of 234 centimeters (7’8″). Anna Haining Bates was born in Mill Brook, Nova Scotia, in August 1846. She was just like every other child until she suddenly started growing taller. At age five, she was 142 centimeters (4’8″) and weighed over 45 kilograms (100 lb). By the time she was 22, she was 229 centimeters (7’6″) and weighed 159 kilograms (350 lb). Bates went into show business at age 16. She often appeared with a dwarf standing beside her for greater effect. In July 1865, she was almost burned to death in a fire at Barnum’s museum. The stairs were on fire, and she was too tall to jump out the window. She was saved when employees broke the walls and lifted her out with a crane. 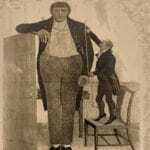 In 1871, she met another giant, Martin Van Buren Bates (aka the “Kentucky Giant”) who was 221 centimeters (7’3″) even though he is often said to have been 234 centimeters (7’8″). They got married and were often exhibited in circuses as “the largest married couple in the world.” Their house was oversized, with 2.6-meter-high (8.5 ft) doors and extra-large furniture. The couple had two children, but both died at birth. The first, a girl, was 69 centimeters (27 in) tall and weighed 8 kilograms (18 lb). She died soon after birth. The other, a boy, was 76 centimeters (30 in) tall and weighed 10 kilograms (23 lb). He died 11 hours after birth. Bates herself died in 1888 at age 41. In the 1840s, Zhan Shichai (aka “Chang Woo Gow” or “Chang Yu Sing”) was born in China. He grew to be 236 centimeters (7’9″) tall and was appointed a member of the emperor’s court. He later left China for England for what was supposed to be a brief visit. But he ended up spending two years there. During that time, thousands of people paid three shillings just to see him. Zhan went on to tour the rest of Europe and was sometimes exhibited alongside a dwarf. In 1881, he joined P.T. Barnum’s circus. He had lots of female admirers and was often asked if he was married. Zhan died in 1893. According to his wishes, his funeral was attended by only 50 friends. His coffin was 2.6 meters (8.5 ft) long. Joseph Edouard Beaupre was born in Willow Bunch, Saskatchewan, on January 9, 1881. His parents were of average height. So was he until age three when he started growing abnormally. By the time he was nine, he had outgrown his parents. At 12, he was 198 centimeters (6’6″), and at 17, he was 216 centimeters (7’1″). It was at this age that he lifted a 363-kilogram (800 lb) horse. Beaupre continued growing, reaching 251 centimeters (8’3″) in 1904. He wore gigantic, custom-made, size 22 shoes. He tried to become a cowboy. But he dumped the plans because his feet touched the ground while he was on his horse. At 21, he joined a circus. This took its toll on him, and he often had problems sleeping. He also suffered from tuberculosis, which made him cough a lot. He died on July 3, 1904, at age 23 after coughing up blood and becoming unconscious after a performance. The circus refused to pay his burial expenses, and his father, Gaspard, was too poor to afford it. Beaupre’s body remained with the undertakers and soon started appearing in store windows and museums. In 1907, his corpse was found in a hangar abandoned by a circus. The body was taken to Montreal University where it was mummified and stored. In 1970, his descendant, Ovila Lesperance, discovered his body and asked the university to release it for burial. Initially, the university refused over concerns that someone could steal the corpse and display it again. They finally released it, and Beaupre’s body was cremated in September 1989, 85 years after his death. Patrick Cotter was born in Kinsale, Ireland, on January 19, 1760. He grew to be 246 centimeters (8’1″), making him the first of 13 known people to grow past 244 centimeters (8’0″). At 18, he worked as a bricklayer. He did not need a ladder to reach the top of cottages like the rest of his colleagues. Instead, he just stretched his hand to do whatever he wanted to do. He later went into show business where he called himself “O’Brien” after several fabled tall Irish kings. Cotter moved around in a specially made carriage. Once, the carriage was stopped by a highwayman who fled upon seeing Cotter inside. His exceptional weight took its toll on his body, leading to his death on September 8, 1806, at age 46. Arthur Caley was born in Sulby, Isle of Man, in 1824. He was of normal size until his late teens when he suddenly started growing taller. He reached 241 centimeters (7’11”) and weighed over 178 kilograms (392 lb). This earned him the name, the “Manx Giant.” Unlike most giants, he was not tall and slim because he also increased in width. Caley frequently appeared in exhibits in Manchester, London, and Paris before suddenly disappearing. His mother said that he was dead and buried. Some doubted this because his life had been insured for £2,000 only a few weeks earlier. They believed that his supposed death was an insurance fraud and that a tree had been buried in his place. In reality, Caley was not dead. He had traveled to the US where he joined P.T. Barnum’s circus. He was exhibited as “Colonel Routh Goshen, the Arabian Giant.” His former life as the Manx Giant remained a well-kept secret until his death in 1889. Robert Wadlow was born on February 22, 1918. He was of normal size at birth but quickly started growing. At five, he was already 163 centimeters (5’4″) and wearing clothes intended for teenagers. At eight, he was taller than his 180-centimeter-tall (5’11”) father and could even carry him up the stairs of their home. When Robert joined the Boy Scouts at 13, he had his uniform, tent, and sleeping bag specially made for him. Wadlow reached 245 centimeters (8’1″) at 17, making him the tallest teenager ever. In 1936, he joined the Ringling Brothers Circus as a curiosity. He had a huge appetite and ate 8,000 calories a day. Unfortunately, he had problems walking. Wadlow often wore braces on his legs and used a walking stick. Nevertheless, he continued growing. This became a problem when he received a poorly fitted brace in 1940. Just one week later, the brace caused a blister on his ankle that quickly became infected. The infection killed him on July 15, 1940. He was just 22. His coffin was 3.3 meters (10.8 ft) long, 81 centimeters (32 in) wide, and 76 centimeters (30 in) deep. The last time Wadlow was measured was on June 27, 1940, when he was 272 centimeters (8’11”). His hands and feet were 32.3 centimeters (12.7 in) and 47 centimeters (18.5 in) long, respectively, making them the longest ever. Angus MacAskill was born on the Isle of Berneray in Scotland in 1825. Today, the Guinness World Records recognizes him as the tallest “true giant” ever because his unusual height was not caused by any growth abnormality. Interestingly, he was so small at birth that doctors thought he would not survive. While he only grew to be 236 centimeters (7’9″), MacAskill had the biggest chest ever at 203 centimeters (80 in). His feet were 41 centimeters (16 in) long and 20 centimeters (8 in) wide, his shoulders were 112 centimeters (44 in) wide, and his palms were 20 centimeters (8 in) wide. He weighed a massive 227 kilograms (500 lb) and could lift a 1,270-kilogram (2,800 lb) ship’s anchor. He could also carry two 159-kilogram (350 lb) barrels under his arms and lift a 45-kilogram (100 lb) weight for 10 minutes with two fingers. MacAskill often received requests from people willing to wrestle with him. One insistent man ultimately changed his mind after MacAskill shook his hand until it bled. MacAskill joined the circus in 1849, touring Cuba and the East Indies before going to Europe and North America. He opened a store and went into real estate after retirement. In 1863, he died of brain fever. Bernard Coyne (aka “Bernard the Giant”) was born in Anthon, Iowa, on July 27, 1897. His height is disputed. Some say he was 249 centimeters (8’2″), others say he was 254 centimeters (8’4″), and still more say he was 264 centimeters (8’8″). Whichever it was, he was over 244 centimeters (8’0″), which was so tall that he was rejected by the army during World War I. Unlike most other extremely tall people whose unusual heights are caused by abnormalities in the pituitary gland, Bernard’s height resulted from eunuchoidal-infantile gigantism, a rare syndrome. His parents placed him on exhibit for money when he was younger but stopped over fears that they might incur God’s wrath. Bernard turned down several requests to exhibit himself as he grew older and preferred living a quiet life. His shoes were a massive size 24, and he weighed 136 kilograms (300 lb). He died on May 20, 1921, at age 23.